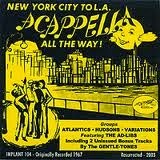 The Atlantics were from Jersey City, NJ. They formed in 1964 and in 1967 recorded on the Acappella Records, Inc. label. The group consisted of Eddie Davenport, Charley Gaston, Eddie Love, John Allen and Charles "Cada" Brooks. If you have any info, please provide in the comments section of this blog.